Do you think you have to have an ‘eye’ for styling or can anyone make a space look well styled? I think some people are born with a natural gift for styling but anyone essentially can learn good taste or what works, it’s just about getting the hands on experience and being around people who are masters at what they do. What is a good starting point for styling an area? A cohesive colour scheme probably. You can work with different styles, patterns, fabrics and finishes so long as the colour scheme holds it all together. If you don’t have that thing tying the thread between different pieces then it could look like a bit of a mess! Do you have any tricks that you always use when styling in a home? Not any that would work in every home, because the whole point of every home is that it’s different and should be a reflection of the inhabitants and their personalities. If I was styling for a homeowner (rather than a brand), I’d spend lots of time getting to know them and what makes them tick. Do they know their own style and why? If not, I’d work on that with them before I did anything. What would be your best piece of advice for making a sideboard more interesting? Objects in threes often work quite nicely, or symmetry – so placing a lamp at either end for instance. I would always suggest people go and find pieces that interest them and have meaning rather than whatever is on trend for that season. I also try to vary textures and colours to provide contrast. So a sleek lamp might go next to something with a jagged finish for instance. What are your favourite go to objects to style a coffee table? Coffee table books, table lamps, little boxes, plants, flowers, interesting objects from nature like crystals… anything goes! It’s just how you put it together. How can someone create the perfect ‘shelfie’? I like to create stacks of books and then place a little object on top. I also rely on cute storage boxes or things that can hide clutter. It’s about looking at the shelf/shelves as a whole and giving things space to breathe. You want your eye to move around what you have there instead of being drawn to one main focal point. Which areas of the home can be tricky to style? How can we overcome this? Around the TV for sure! My husband hates anything being next to the TV or behind it as he says it distracts him for the screen. If I had my way I’d have objects, books or plants either side to try and stop the TV standing out like a sore thumb. Alas, I am stuck with it just sitting there like a big blob! 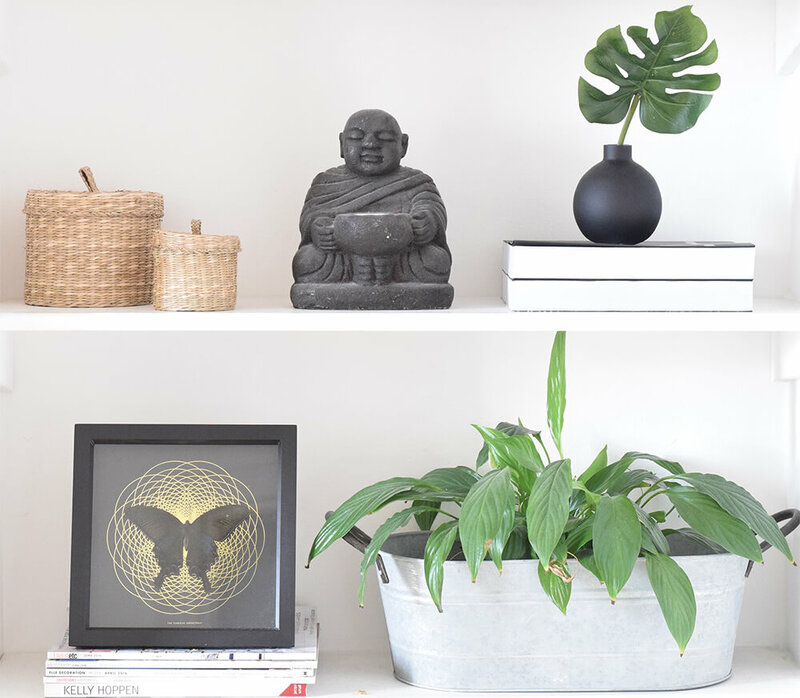 If you’re happy to style around it then a shelf above or items either side can help it looked a little more lived-in. 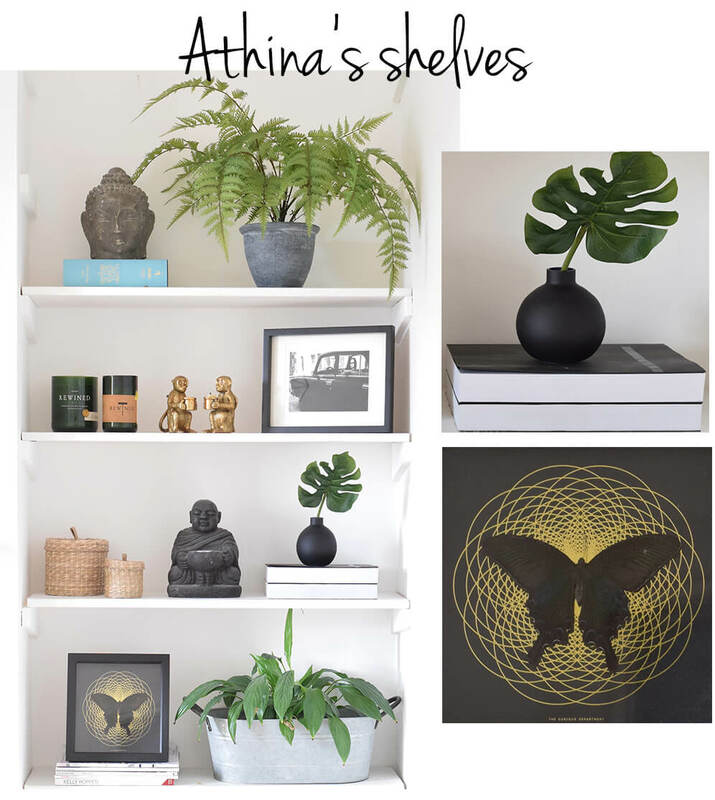 Interview and images by Athina Bluff at Tolopogy Interiors. For more tips you can follow Sarah at Sarah Akwisombe.